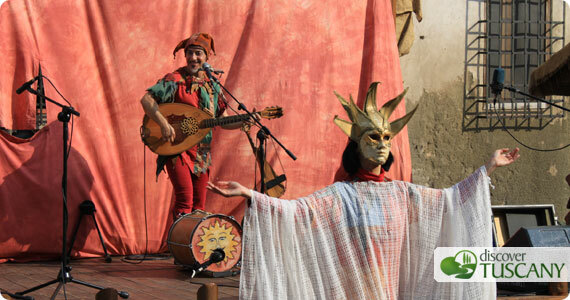 Anyone who has read our blog for a while probably has already understood we love to go to medieval festivals and that we often return to the ones held in Monteriggioni, Volterra and Roccatederighi in Tuscany. When we found out there would be a similar festival in Colle Val d’Elsa this year, right away we marked it on our calendars. This past Sunday, July 3, the entire Discover Tuscany made their way to Colle to go to “The Renaissance of Colle between 1479 and 1592”. The dates the event’s official title refers to are important for Colle: the first marks the year Florence conceeded Colle citizenship in exchange for their fedelty against the Sienese enemy (1479) and the other was when Colle was proclaimed a diocese, marking it a city to all effects (1592). Colle is a very charming town and the festival/historical reenactment is definitely a perfect occasion to get to know all its corners and narrow streets as you explore. 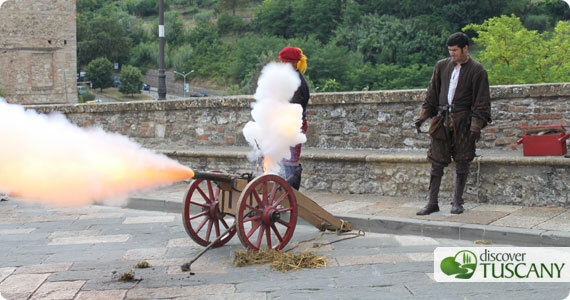 We were greeted by the blast of a cannon as we arrived to the entrance to the castle located in “Colle Alta” where the festival was taking place. As a practical side note, you should know that Colle’s historical center is at the top of the hill where the castle is located; with limited space, the town in modern times has continued to grow in the plain below the castle. 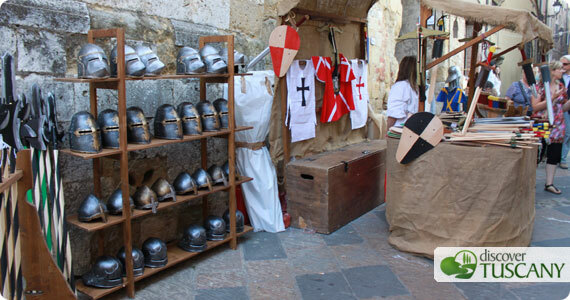 As soon as entered through the walls, the streets were full of life with many people in period costumes attending to the various stands showcasing medieval/Renaissance crafts. We soon met up with a group of satires walking on stilts among the crowd, as well as Metenio Atrippa with his curious camel beast and other interesting characters that were entertaining the public. We quickly reached the main square where La Giostra had just started playing their lively music on the stage: it was difficult to not tap your foot or feet to the beat of the music! In this main square various groups entertained the crowds continuously, many of the best we’ve seen at various medieval festivals. All were presented by the fantastic Giullar Cortese, who improvises in rhyme as he pokes fun and interacts with the public. We were happy to watch the Giullari del Diavolo once again perform their magic on the crowd with their entertaining and impressive show. 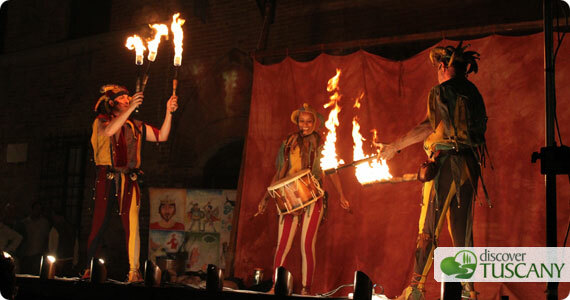 The theatrical piece by the Zorba Officine Creative in the evening was a bit difficult to understand. We also saw the Errabundi Musici performing both on stage as well as on the streets, their bagpipes and drums were definitely better enjoyed along the streets as background music to the general festivities. Even if this was just the first edition for the festival, which was smaller compared to some of the better known ones, the quality of the performers and of the various attractions, crafts, and general feel was high and we were very pleasantly impressed. 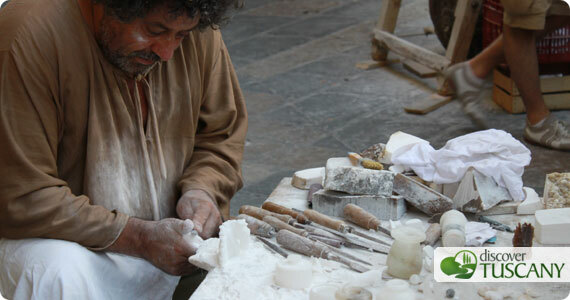 Perhaps the only part that requires some work is the offer of street “medieval” food and drinks which are often set up alongside the crafts. Here we only found it in the main square so future editions could offer a few more options and stands throughout the castle’s streets. After the dinner hour the festival was in full swing, the castle was full of people including young adults that started dancing in the square. We were right along with them, enjoying and dancing along to the music performed by La Giostra until midnight! We look forward to going back to this summer festival next year and if you’re here then, we’ll keep our calendar updated with the precise dates to head to Colle di Val d’Elsa!